What would George Washington do about weapons of mass destruction? How would Benjamin Franklin feel about unwed mothers? What would Alexander Hamilton think about minorities in the military? Examining a host of issues from terrorism to women's rights, acclaimed historian Richard Brookhiser reveals why we still turn to the Founders in moments of struggle, farce, or disaster. Washington, Franklin, Jefferson, Hamilton, Madison, Adams and all the rest have an unshakable hold on our collective imagination. We trust them more than today's politicians because they built our country, they wrote our user's manuals-the Declaration of Independence, the Constitution-and they ran the nation while it was still under warranty and could be returned to the manufacturer. If anyone knows how the U.S.A. should work, it must be the Founders. Brookhiser uses his vast knowledge to apply their views to today's issues. He also explores why what the Founders would think still matters. 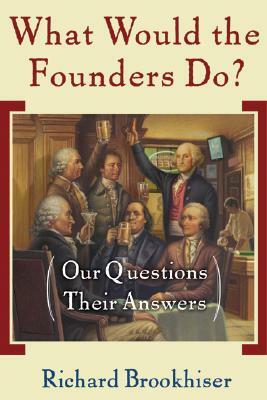 Written with Brookhiser's trademark eloquence and wit, while drawing on his deep understanding of American history, What Would the Founders Do? sheds new light on the disagreements and debates that have shaped our country from the beginning. Now, more than ever, we need the Founders-inspiring, argumentative, amusing know-it-alls-to help us work through the issues that divide us.